Those who are using their new iPhone 4S are reporting a small problem with battery life. Just like the antenna issue of the last iPhone model, this problem is alleviated by taking a few jaunts in the menus of the smartphone. If you have ever asked, “How can I get my iPhone 4S battery to last longer?”, here are some helpful tips. Most every new model or version of smartphones will not be working perfectly. This is especially true if the mobile operating system has been modified to a great extent. The iPhone 4S seems to be having a problem with its new internals. The good news is that the battery may be getting drained quickly, but some quick settings in the menus of the iPhone can help cut that drain down. If you find your iPhone 4S shutting down early because of a low battery, try the following. The calendar app can use up battery juice even if you are not specifically taking a look at the dates. The reports coming in are saying that the calendar is updating itself in the “Notifications Center” of the iPhone 4S. This will of course drain the battery if it happening automatically. The fix? Disable the calendar app in the Notifications Center in the menus of the smartphone. It is not a nice thing to have to do, but perhaps necessary. Another battery saving tip for the iPhone 4S is to change some settings for the time zone. Oliver Haslam, an iPhone user noticed that he could get nearly twice the battery life from the handset if he shut off location services and “time zone”. Some apps will use this feature to constantly update their programs, such as Groupon or TapTapRevenge. When your iPhone is not constantly trying to contact other computers to report where it is, the battery is used less. You can find the location control in the “Settings”, “Location Services”, “System Services” and finally at the bottom, the “Setting Time Zone”. Turn off time zone and the previously mentioned location services. The email program in an iPhone 4S can be pinging servers online for your updates. This is another way the battery can be drained, especially if there is more than one email account that is being automatically checked. Turn this off. Take a look at the email accounts and if you can turn off some of the pinging, so much the better. Just turning off the frequency of pinging helps. If there are emails you must have immediately this tip may not work for you. The rest of the things that can be turned off are simple. If your iPhone 4S is set to be constantly looking out for Wi-Fi connections, turn it off. Bluetooth is the same. Some of these settings are also good things to remember for plain old security reasons. 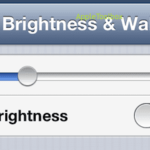 If you can turn down the screen brightness, this is another common way to increase battery life. A quick way to do much of the above is to switch to “Airplane Mode”, even if you are not on a flight. Still using my iPhone 4 and loving it! Thanks a lot this is very informative.